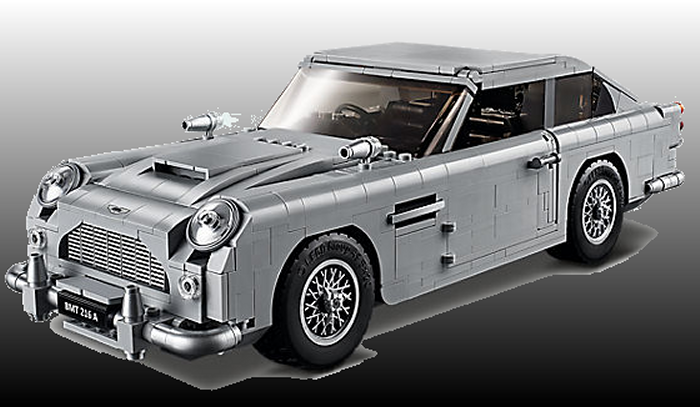 Continuning BIG TICKET DAY, we have the very cool LEGO Creator James Bond Aston Martin DB5. Your best bet (and price) is to order it directly from LEGO. Open the doors and you’ll discover a detailed interior with a concealable radar tracker and a door compartment containing a telephone. And when it’s time for action, activate the passenger ejector seat, turn the revolving number plates, raise the rear-window bulletproof screen, deploy the wheel-mounted tyre scythes and pull back the gearstick to reveal the front wing machine guns. This collectible model car also features a detailed straight-6 engine, drum-lacquered silver front and rear bumpers, moulded silver-coloured wire wheel rim inserts and front and rear Aston Martin logos. The model has been designed to provide a challenging and rewarding building experience full of nostalgia—a must-have for fans of the Aston Martin DB5, James Bond movies and LEGO building sets. Just like the Aston Martin in Goldfinger, this sporty vehicle has a few tricks up its sleeve. Lift the bonnet to check out the straight-6 engine detailing. Pull back the rear bumper to eject unwelcome passengers. Revolve the number plates, raise the rear-window bulletproof screen and deploy the wheel-mounted tyre scythes. Pull back the gearstick to reveal the front wing machine guns. Collectors can own this collectible replica of the Aston Martin DB5, as featured in the classic James Bond™ Goldfinger movie. And they get to build it themselves. 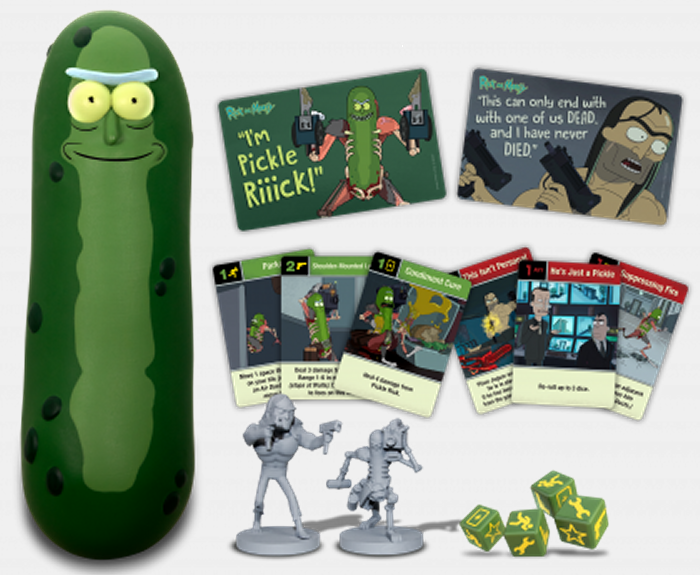 This set includes over 1,290 pieces and is suitable for ages 16+. The finished model is thirteen inches long, three inches tall and four inches wide, and it’s the perfect gift for the Bond fanatic on your gift list who also likes to build things. You can find it in LEGO stores, or order it from them online, where you can expect to spend a hundred and fifty bucks or so. 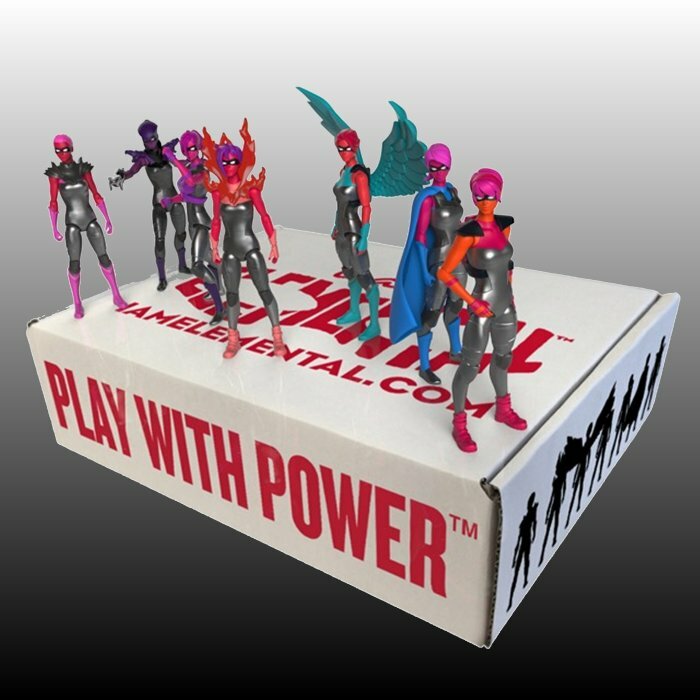 IAmElemental, the toy company that pioneered strong, healthy female action figures, has issued limited-edition gift sets of its award-winning superheroes for this holiday season. The gift sets feature female action figures from the company’s Series 1/Courage (Bravery, Energy, Honesty, Industry, Enthusiasm, Persistence and Fear) and Series 2/Wisdom (Creativity, Ingenuity, Curiosity, Logic, Exploration, Mastery and Oblivion). We told you about IAmElemental a few years ago when we encountered their founder at the International Toy Fair in New York, and it’s great to see that they’re still going strong and making their figures available in these affordable gift sets for the holiday season. There is a special gift set that’s exclusive to Cocoa Crayon. TheElements of PowerBoard Book, introducing young children to the positive and powerful messages of the IAmElemental universe; and Courage Tableware Set, a child-size place setting including an 8.5” plate, a 5” bowl and a 10.7 oz glass. Three randomly selected Series 1/Courage Mystery Packs, each with a 3.75” Courage action figure and powerful accessories, for the price of two. IAmElemental’s 3.75” female action figures offer nine points of articulation and come with a removable, interchangeable accessory, a shield that can also be worn as a charm, and two trading cards – one to keep and one to share. TheElements of Power Board Book, introducing young children to the positive and powerful messages of the IAmElemental universe. One randomly selected Series 2/Wisdom Blister Pack, with a 3.75” action figure and powerful accessories. Inspired by Hypatia, Series 2/Wisdom female action figures were finalists for 2018 Toy of the Year. These are perfect gifts for young girls who like action figures, but want to play with female figures. Collectors of 3 3/4″ figures will also be struck by the high quality and detail on these figures. 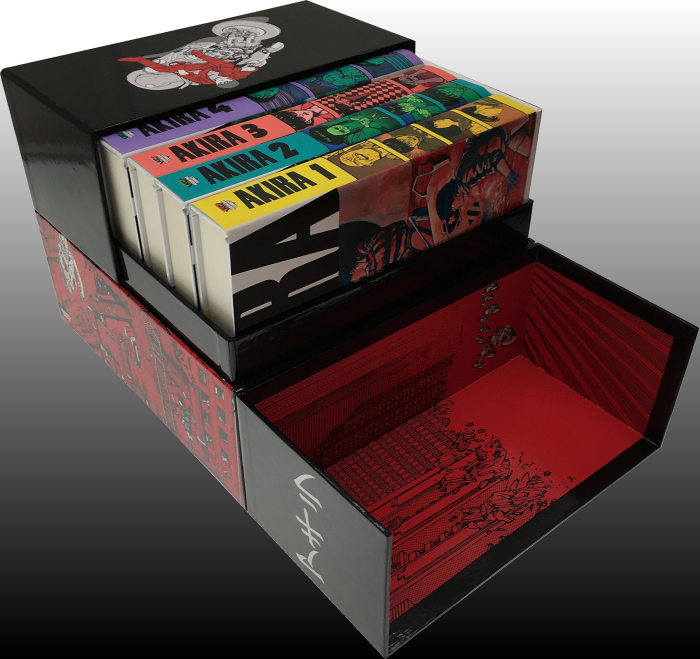 This immaculate hardcover collection of the mini-series is the perfect gift for the fan of gothic horror or just folks who appreciate beautiful comic art on your shopping list. Inspired by Mary Shelley’s immortal gothic horror tale, Frankenstein Alive, Alive brings new life to the Promethean monster, courtesy of Steve Niles (30 Days of Night) and Bernie Wrightson (Frankenstein, Swamp Thing). Victor Frankenstein’s cobbled together creature continues his adventures, embarking on a journey to discover his own humanity. Collecting the four-issue series along with an extended gallery section of never-before-seen layouts and pencils by Wrightson, all scanned from the original art. 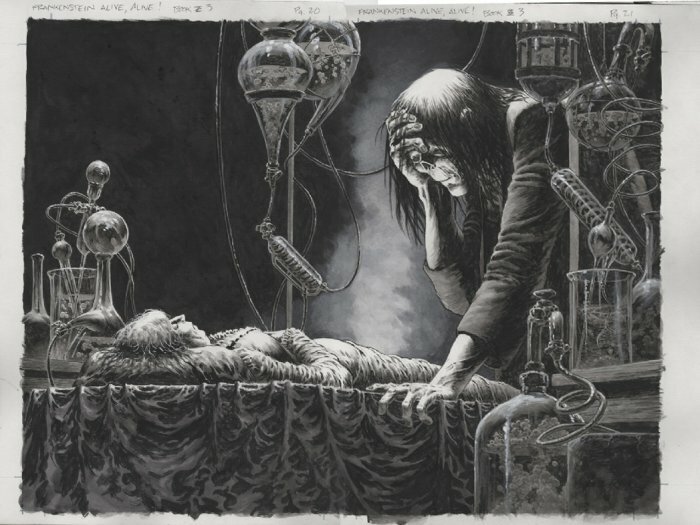 This is the final art produced by Bernie Wrightson, a master of modern horror art, who lost his battle with brain cancer before the original mini-series was finished. Additional art is supplied in the final chapter by Kelley Jones (at Wrightson’s request), who stepped in to complete the series upon the comic book legend’s untimely passing. This book collects some of the finest work by one of the best artists to ever illustrate comics. Niles is also a master of the horror comic, as a writer, and he crafted a story that played perfectly to Wrightson’s many strengths. Wrightson had been associated various adaptations and interpretations of the story of the Frankenstein Monster since the mid-1970s, and this book was seen as the crowning achievement of his storied career. It is a real work of art. 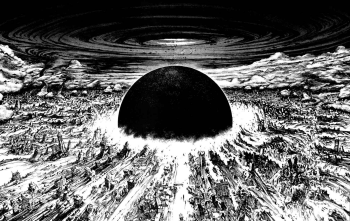 Kelly Jones also deserves major kudos for stepping into a very challenging position and admirably filling the shoes of Wrightson to finish this work. That he was hand-picked by Wrightson is a testament to his considerable talents. Using the ISBN code, you ought to be able to order this book from any bookseller, but be advised that Amazon has it for about eight bucks less than the list price. Okay, I realize that you probably don’t really need instructions for a gift guide, but just so you know what to expect over the next month, I’m going to try to lay out everything as clearly as possible. 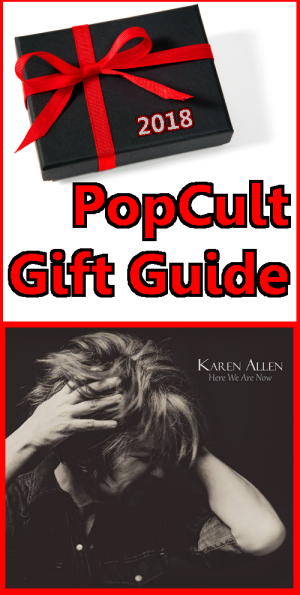 This is the fourteenth annual PopCult Gift Guide, and every year I try to suggest cool things that I think my readers would like to know about so they can give them (or receive them) as Christmas (or Hanukah, or Kwaanza, or whatever) gifts this holiday season. Every year we do things a little differently that we have before, and 2018 is no exception. 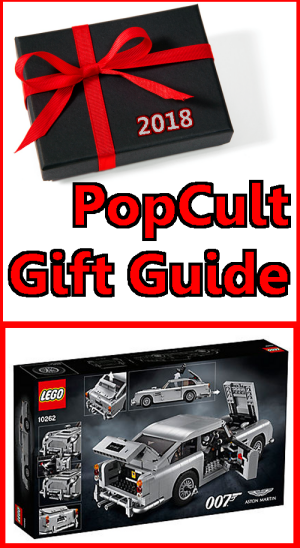 Superficially, I’m not putting the words “PopCult Gift Guide” in the headline for each post. It makes the links a tad unwieldy, and any readers ought to be able to discern what they’re reader from the context and the graphics. I’ve also added an extra graphic to our header post, to drive that point home, although it’ll disappear after December 1, so that won’t really be an issue for folks reading these as archives posts in the future. And oddly enough, some of my previous gift guide posts still attract readers more than ten years after they were originally published, all year-round. I have made one change since the preview post I put up last week. Instead of Saturday being BIG TICKET DAY, where each gift idea costs more than a hundred bucks, now Saturday and Sunday will both be BIG TICKET DAY, where I reccomend two gifts per day, and each gift idea will cost over sixty dollars. The main reason for the change is that a lot of the things I was going to recommend have dropped in price since I first started compiling my list, and this way we can still include them all. This means that through the week, each gift suggestion should cost you under sixty bucks. I will try to include at least one local-to-West Virginia item every weekday. Some of these will be recommendations for Charleston-area stores or restaurants. Many items I suggest will only be available online, and I’ll include links for ordering, but in the case of things that are available locally, I will try to tip you off to where you can shop local. My readership is about 20% local and 80% everywhere else, so please don’t get upset if it seems like I’m not doing enough to promote our local businesses. Posts should go up in the afternoon each day, and you can expect at least three gift ideas a day, and as many as five. 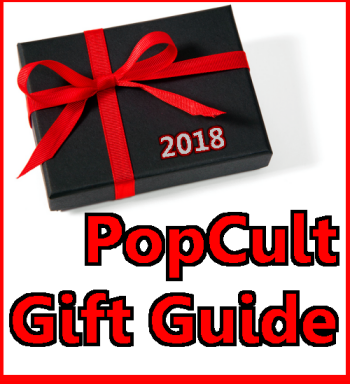 The 2018 PopCult Gift Guide runs the entire month of November, so if you have to order something, you should have plenty of time to get it delivered. During the gift guide, we are suspending two of our regular features, The RFC Flashback and Sunday Evening Videos. You can still expect to find Monday Morning Art and The PopCulteer on their usual days. With those points established, and also with the guide already underway (we started with three gift ideas yesterday–you can find links to the right), let’s let things resume. Look for three more posts later today. 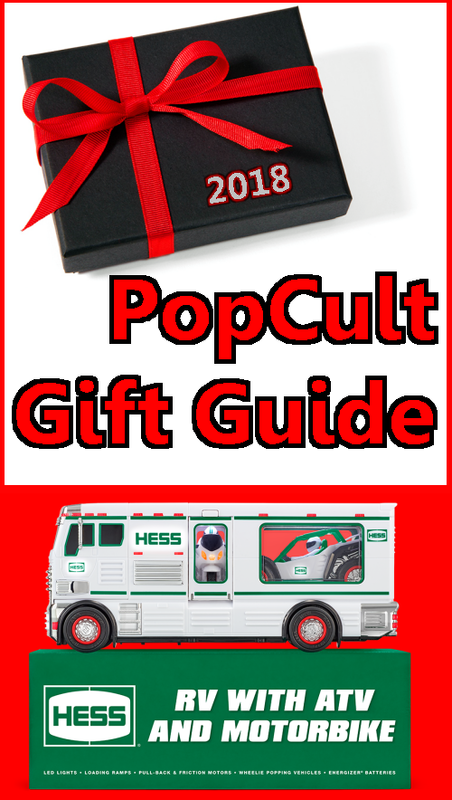 As has become tradition, our first day of The PopCult Gift Guide includes this year’s HESS Toy Truck. We tell you about this one on the first day because it’s a limited edition, and if we held off, they might sell out before you can get your hands on one. Once sold in HESS Oil gas stations, these keepsakes are now only sold online, since HESS sold their retail outlets to Marathon Oil a few years ago. This year HESS released a bonus truck, an 85th anniversary edition of their very first tanker truck, and it sold out in less than two days, so you don’t want to wait around on this one. 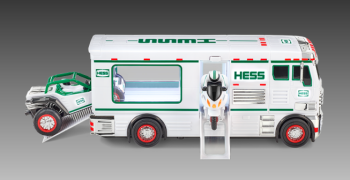 This year lucky kids and collectors can get The 2018 Hess RV with ATV and Motorbike. a powersport trio ready for any adventure. The set features a sleek and modern recreational transport loaded with lights, and a spirited wheelie-popping pair of teammates eager for on and off-road action! The RV is strikingly vibrant with 60 LED lights, a gleaming chrome front, white body, contrasting black fenders, and dark tinted cab windows. Clear windows showcase the two internally illuminated compartments housing the ATV and Motorbike, which are accessed by button-release drop-down ramp doors. The ATV has oversized, terrain-tough tires that partner with a powerful pull-back motor to race flat or flash its impressive wheelie-action. A roll cage encloses the driver while the 10 switch-activated lights and chrome details shine bright. Getting in on the race challenge and wheelie-popping power is the sport-tourer style Motorbike, with a push-friction motor, and working head and tail lights. One change this year, which may be considered a blessing to some parents, the HESS RV with ATV and Motorbike does NOT have any sound features. Some folks might miss them, others will be very happy to see them go. In total, this 3-in-1 combo includes an eye-popping 73 lights, the most ever on a holiday Hess Toy Truck! 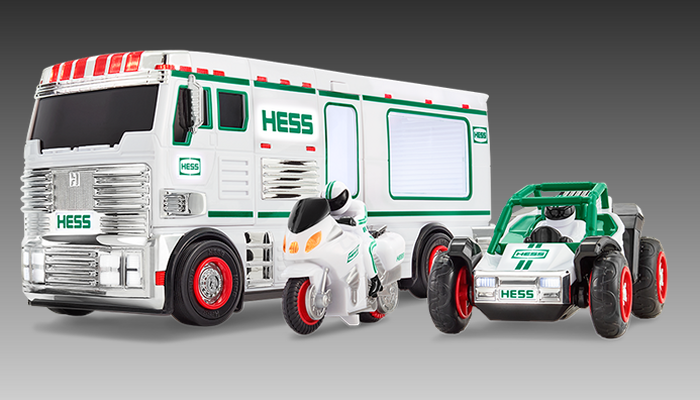 The 2018 Hess RV with ATV and Motorbike is sold exclusively he at The Hess Toy Truck website, for $33.99 plus tax, which includes 8 Energizer® batteries and free standard shipping. Our first pick in the 2018 PopCult Gift Guide is a graphic novel by Jason Pell, Pinpricks: A Book of Tiny and Terrible Oddities, which I told you about back in its Kickstarter incubation stage earlier this year. The book is now available, and I highly recommend it as a gift for fans of the macabre and the unusual. Pinpricks: A Book of Tiny and Terrible Oddities is not really a novel, per se. It’s one-hundred and one illustrated short stories of misfits, monsters, and the terminally awkward. You will meet unusual characters who get caught up in extraordinary situations, which get resolved very quickly in ways you won’t expect. You will meet monsters and madmen and mimes and very unusual children among the many short, short stories. Pell’s cleverness shines through as he crafts atmospheric scenarios with a minimum of words and pictures. This compact book of eerie vignettes is the perfect gift for the person who enjoys the offbeat elements of life. You can order it from Amazon, where it is currently just under $16.